The Fellowships Office is an essential resource for anyone who is applying for a nationally-competitive fellowship or scholarship and for many who wish to pursue research or study abroad experiences. 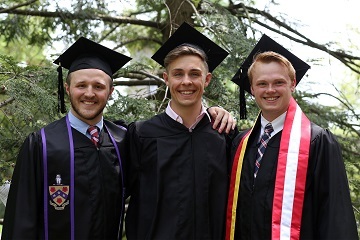 Whether you are just beginning your Wabash career, are a current student or are a recent alum, Fellowship Advisor Susan Albrecht will work one-on-one with you to help identify opportunities and provide assistance throughout the application process. A number of information sessions and informal drop-in sessions are also offered throughout the year. MONDAY, APRIL 15 - RECEPTION FOR ALL 2018-19 FELLOWSHIP APPLICANTS - 11:45 AM - 12:45 pm ~ 1832 Brew lounge ~ Come celebrate the efforts of all students who applied for a fellowship this past year, along with the faculty and staff who supported them. ENTIRELY NEW TO FELLOWSHIPS? READ ON! WHAT IS A FELLOWSHIP? Fellowships are merit-based awards granted to students or alumni which provide for a variety of opportunities: research, teaching, travel, professional/academic development, study at the graduate (and sometimes undergraduate) level, and/or entrepreneurial pursuits. They are provided by a wide range of public and private organizations, foundations and institutions. Opportunities range from short-term summer experiences to several years of graduate study. Some focus on specific work or service projects, while others offer tremendous flexibility for the recipient to design his or her own research or study program. The awards are highly sought after, and competition is rigorous. WHY CONSIDER A FELLOWSHIP? Post-graduate fellowships offer a wide range of alternatives to directly pursuing employment or graduate school. Programs vary in structure, format, length, and focus, and many involve academic pursuits. You may want to explore such alternatives if you are refining your interests, want to build experience, or if you recognize that such a period of specialized research, study or teaching might help you to advance towards your desired professional or career goals. Nationally-competitive fellowships for graduates and undergraduates recognize outstanding achievement in one or more areas. Some focus on academic excellence. Others focus on leadership, international ambassadorial potential, or a commitment to service and to improving the lives of others. Many consider a combination of these factors. Winning a fellowship can be a truly life-changing event – opening doors, offering funding for experiences which might otherwise be difficult to arrange, and providing important introductions and connections to others with like interests, goals or research emphasis. IS IT WORTH THE TIME AND EFFORT? The application process can be complex, time-consuming and arduous. That said, simply completing the process of applying for a fellowship can be an enlightening and rewarding experience. Nationally-competitive fellowships require applicants to do the kind of writing which demands reflection, self-examination and consideration of the values, dreams and hopes which the candidate holds most dear. Win or lose, the applicant who gives his best effort is likely to know himself better and to be more prepared to approach applications for employment, internships, or graduate or professional school. Ready to talk over options or simply have questions? Please schedule an appointment.